His middle name, Pershing, was in honor of the World War I General Pershing, then commanding officer of the European conflict. 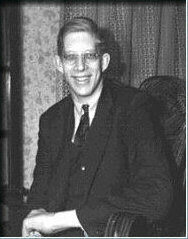 Robert was the first born of Addie and Harold Wadlow. 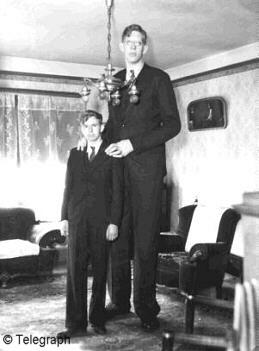 Later the Wadlow family grew with the addition of two sisters, Helen and Betty, and two brothers, Eugene and Harold Jr. 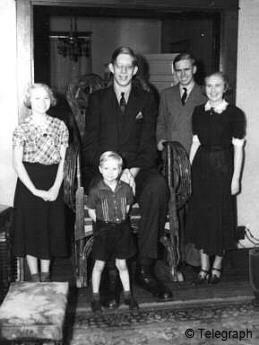 Despite Robert's size, all of his family members (photo) were of normal height and weight. Robert's body was brought back to his home town of Alton for burial. The 1,000-pound casket required a dozen pallbearers, assisted by eight other men. Out of respect for Alton's Gentle Giant, all city businesses closed for the funeral. Over 40,000 people signed the guest register. Robert's gravestone simply reads "At Rest." 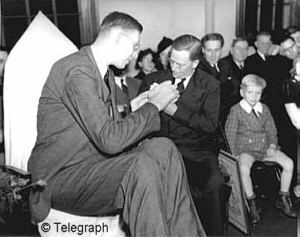 Robert Wadlow holds a special place in Alton's history. He is remembered as a quiet young man who overcame a unique handicap, and who was an inspiration to all of those that knew him. 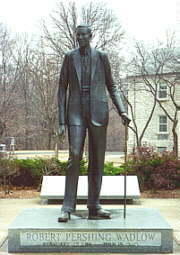 In 1984 a citizens committee organized efforts to immortalize Robert, and in 1985 a bronze statue (photo), was erected on the campus of the Southern Illinois University School of Dental Medicine. Upon Robert's death in 1940, his family had almost all of his belongings destroyed. They did not want collectors to obtain his clothes or personal items, and be displayed as 'freak' memorabilia. We want to continue to honor their wishes, and are displaying what items we have in our museum with pride and dignity. 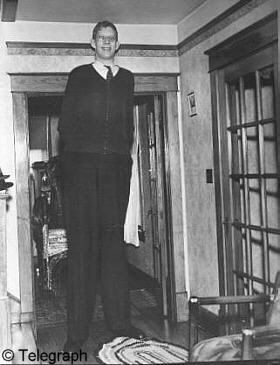 1918 - Robert was born February 22, 1918 to Harold F. and Addie (Johnson) Wadlow on Monroe Street in Alton, Illinois, weighing 8.7 pounds. 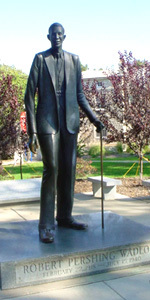 1919 - When Robert began to walk he weighed 40 lbs. 1923 - At 5 years of age, attending kindergarten, Robert was 5' 6 1/2" tall. He wore clothes that would fit a 17 year old boy. 1928 - Ten years old. 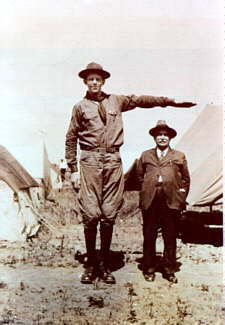 Robert weighed 210 pounds and was 6' 5" tall. His shoes were size 17 1/2. 1929 - Robert takes his first airplane ride. Just before his 12th birthday Robert had his first checkup at Barnes Hospital (St. Louis), where the family learned of his over-active pituitary gland that caused his fantastic growth. 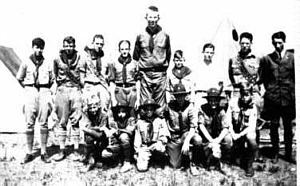 1931 - At the age of 13, and a member of the Boy Scouts, he was the largest Boy Scout in the world. His weight was 270 pounds, and his height was 7' 4". It took 14 yards of 36" wide material to make his Boy Scout uniform. 1933 - Robert received the largest birthday postcard ever delivered by the Alton Post Office. It measured 14" x 22". Robert attended the World's fair in Chicago. It took two turns and 20Â¢ to get Robert through the turnstile. 1935 - 1936 Robert became Advertising Manager of the Tatler - Alton High School Year Book. He graduated in the January class, 1936. 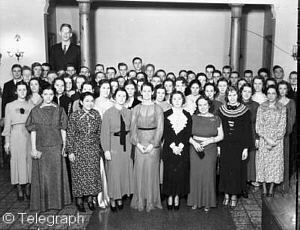 1936 - In February, Robert enrolled in Shurtleff College. 1937 - Robert and his father made an extensive trip west, including Hollywood and most of the western states, as a goodwill ambassador for International Shoe Company. Thereafter, the firm made his shoes free of charge. 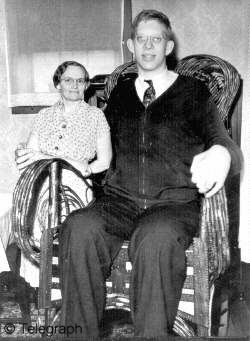 1940 - Robert Wadlow died July 15, 1940. His weight was 490 pounds, his height was 8' 11.1". He was buried July 19, 1940 in Upper Alton Cemetery. 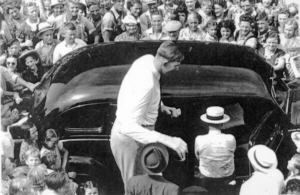 Robert entering his car during a visit to Viroqua, WI. 1939. Memorial Statue - Located on College Avenue in Alton, Illinois. All photos are B/W JPEG, and average 18k in file size. All photos and text are copyright to the Alton Museum of History and Art or their respective donors and cannot be used in any form without written permission. * Photos copyrighted to the Telegraph. We would like to thank Robert Graul and the The Telegraph for their cooperation and assistance on this project. Photos from the Telegraph taken by Robert Graul.